Bulgarian archaeologists are showing off two centuries-old skeletons that they say were pinned down through their chests with iron rods to keep them from turning into vampires — a trend that was all the rage in medieval Europe. The “vampire” skeletons were excavated recently near the Black Sea town of Sozopol, according to reports from The Associated Press and AFP. Bozhidar Dimitrov, head of Bulgaria’s National History Museum, was quoted as saying that corpses were regularly treated this way in some parts of the country until the beginning of the 20th century. About 100 similar burials have been found in Bulgaria over the years. Bulgarian archaeologist Petar Balabanov has found a number of nailed-down skeletons near the eastern town of Debelt, at gravesites dating as far back as the 1st century. According to custom, the bodies had to be pinned down just in case they tried to rise from the grave. Of the many explanations for this Vampire myth, the one I found most interesting is the plague. During which thousands of people were dying with no explanation, and that sounds an awful lot like all the vampire movies! 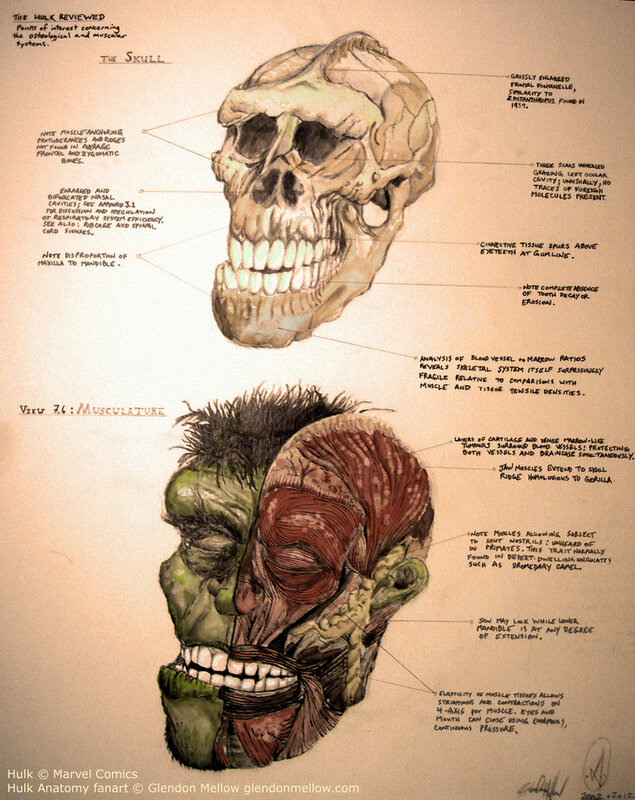 I drew this fan art of Marvel Comics’ Incredible Hulk, dissected and analyzed. Here it is with a new lick of paint. At the time, I tried to draw on not only my mother’s nursing school anatomy textbooks, but also gorilla and hominid ancestor skulls (such as Paranthropus, though my murky text identifies it with the outdated Zinjanthropus name), inspiration for things like the cranial ridge and large jaw muscles. I included details such as 3 scars on the bone (I’m Canadian: Wolverine wrecked his face a few times and I wanted to document that) and perfect glowing teeth. If anyone has perfect shiny teeth, it needs to be Hulk. YouTube is adding monetization options to its live streaming platform, including the ability for publishers to charge for live events. The new feature was announced on YouTube’s publisher blog Tuesday. YouTube has been experimenting with pay-per-view for select publishers. Making the option more widely available could make YouTube’s live streaming more attractive to other sports and entertainment publishers. Of course, YouTube isn’t the only one to offer paid live streaming: Ustream and others have been offering publishers a way to charge for events for some time. The most highly-anticipated light heavyweight title fight of all-time comes to Atlanta on Saturday, April 21st, as UFC 205-pound champion Jon “Bones” Jones defends his crown for the third time against former title holder “Suga” Rashad Evans. They once were friends, but now the time has come for them to settle their grudge in the Octagon once and for all.